The Econometric Game, 2015, is underway! Nikki Wesslius, a member of the organizing committee, has reported to me about the opening day of The Game, saying that it was a really hectic day. Apparently, all of the participants are really enthusiastic about the case study that will form the basis of the competition over the coming days. Speakers at the opening of The Game included the CFO of Ortec (Gerrit Timmer) and Jan Pieter Balkenende (the former Dutch Prime Minister). Both of them talked about the social importance of econometrics. Among the remarks that were made was ‘Econometrics is the least known, most influential science’. 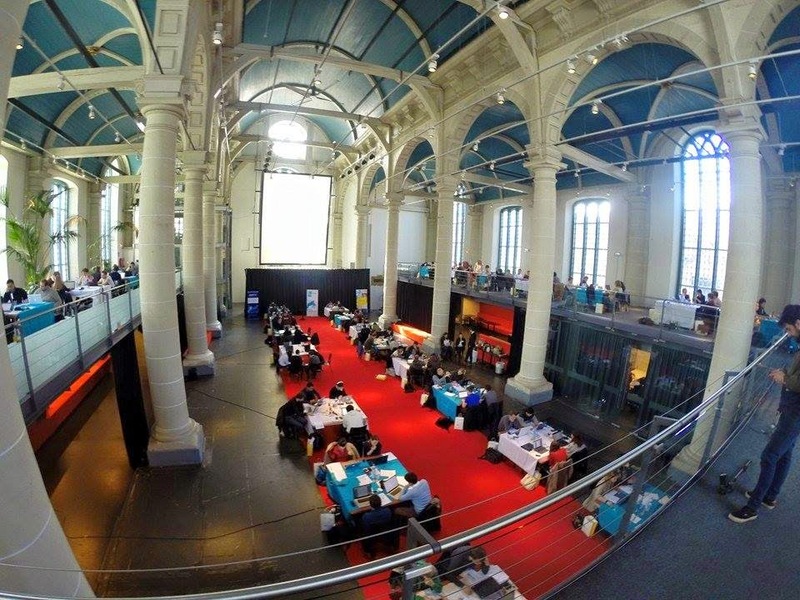 The location for The Game this year is the historic and beautiful Zuiderkerk (Southern Church) in Amsterdam. It was here that Rembrandt van Rijn stored his painting ‘Nachtwacht’ while he was working on it. The case study that forms the basis for The Game this year is titled "Longevity and Longevity Risk". Today, the thirty competing teams received only the articles and the data for the competition. Tomorrow morning they'll receive the exact case questions from the "case makers" for The Game, Bas Werker and Ramon van den Ekker (both of Tilburg University). We'll all be following their progress with great interest! The World Championship of Econometrics! I'll be posting daily while the Game is in progress, providing up-to-date information about what is happening for those of you who won't be in attendance. I'm told that the team from the University of Copenhagen is quietly confident of pulling it off again this year, but we'll have to wait and see. Good luck to all of the participants. Great news today - EViews 9 has now been released. You can read the earlier posts that I prepared while testing the Beta version of EV9 here, here, and here. Congratulations to the team at EViews on this latest development! 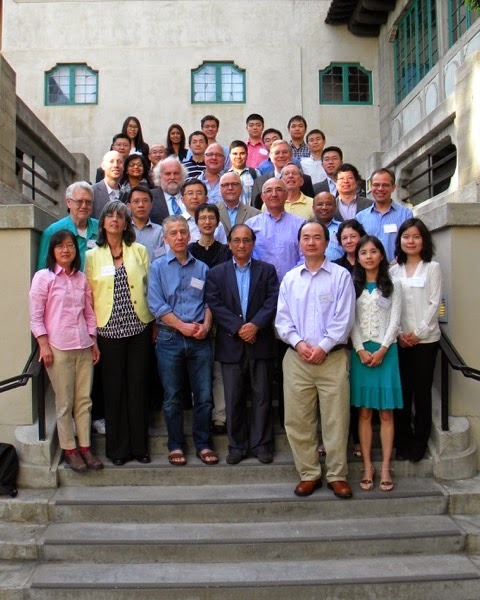 Last weekend, a small conference was held to honour Aman Ullah, a Distinguished Professor in the Department of Economics at the University of California, Riverside. I was to have participated in this gathering, but regrettably those plans had to be curtailed. Aman and I go back a long way, and I remember fondly a period of leave that I spent with him at Western University; and his extended visits to both Monash University and the University of Canterbury. Along the way we managed to co-edit a couple of books together, and to say that I've learned a lot from him would be a huge understatement. The description "a gentleman and a scholar" sits as well with Aman as with anyone else I can think of. Thank you, Aman, for your enormous contributions to our discipline, your good humour, and your friendship. By now, many of you will be aware that the highly influential French economist, Edmond Malinvaud, passed away on 7 March at the age of 91. This is a huge loss for the profession. Malinvaud made many seminal contributions to microeconomics, macroeconomics, and econometrics. You can read the ET Interview of Edmond Malinvaud, by Alberto Holly and Peter Phillips, here. His incomparable and highly acclaimed econometrics text, Statistical Methods of Econometrics , was first published in French in 1964. The first English edition followed in 1966. This was the text for the core course in econometric theory that I took for my Masters degree in 1971. It's heavy emphasis on geometric analysis made it challenging, to say the least! However, this book remains one of the most important to econometrics volumes to have been written. It was ahead of its time in many respects - for instance in its treatment of minimum distance estimation - and re-reading it today still provides important insights. "Finally, we must never forget that our progress in understanding economic laws depends strictly on the quality and abundance of statistical data. Nothing can take the place of the painstaking work of observation of the facts. All improvements in methodology would be in vain if they had to be applied to mediocre data." One decision that we often have to make when modelling with time-series data is whether to use "seasonally adjusted" data, or the original (unadjusted) data. In some cases the decision is effectively made for us - only the seasonally adjusted data are published. This arises, for example, with some U.S. macroeconomic data, and it can be a bit of a pain. For some previous comments on this, see here. However, suppose that we have a choice - original data, or data that have been seasonally adjusted by some filtering method (e.g., the Census X-11/12/13 filter) - and we're interested in testing for Granger causality. Is there any evidence in favour of using one version of the data or the other? Well, yes, there is. Let's take a look at it. Right from its inception in 1985, the journal Econometric Theory has featured the "ET Interviews". These are published interviews with key figures who have helped to shape the discipline of econometrics as we know it. Many of these interviews have been conducted by ET Editor, Peter Phillips, but other interviewers ave also participated. This invaluable contribution provides us with a unique "window" on the history of econometrics, and the ET Interviews should be required reading for all of our graduate students. The very first issue of ET included Peter's interview with Denis Sargan - one of the most influential British econometricians of all time, and Peter's Ph.D. supervisor at the LSE. Since then, interviews with 38 other econometricians and statisticians have been added to the collection. These recorded memories will become increasingly valuable with each passing year.